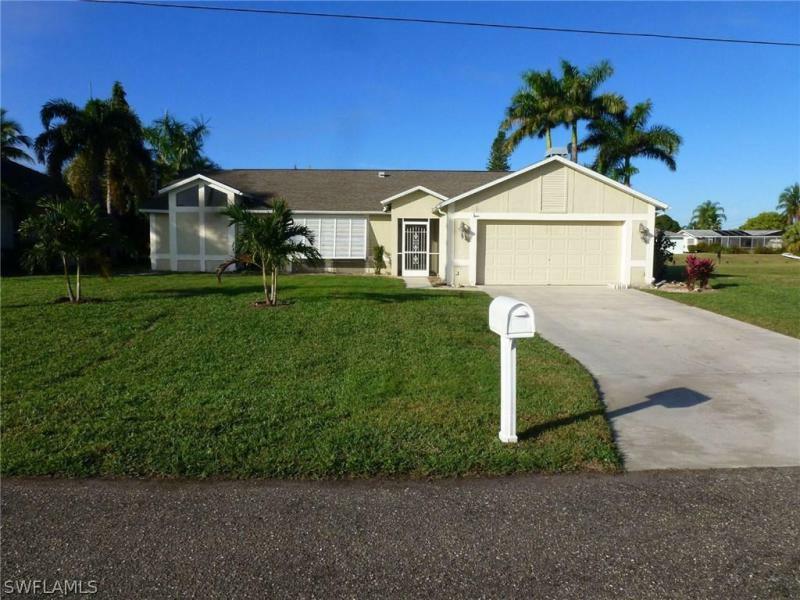 Beautifully located in a sought after area of cape coral, also known as paradise. 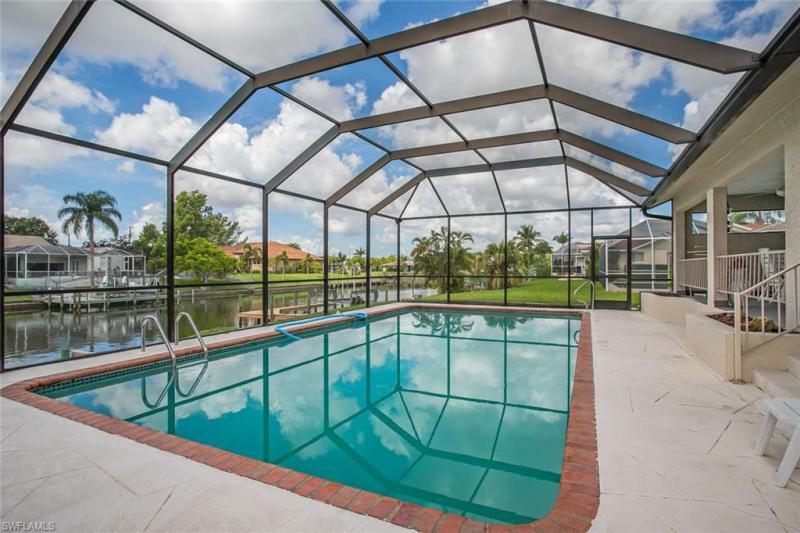 This home is on a direct access canal, cul de sac over-sized corner lot in gold coast estates off everest parkway. Just minutes from the mid-point bridge. Gorgeous pool with paver deck and boat lift. Home has been remodeled to include custom french pattern stone flooring, wood look tile planks in bedrooms, newer tile in guest bath shower with frame-less shower doors, newer stainless steel appliances, front load washer and dryer, new cabinets, granite counter tops and stone back splash. New roof in 2012, upgraded molding and cathedral ceilings. Best producing and tasting mango tree ever! Quiet and safe neighborhood must see! Furniture is negotiable. Estate property. Loads of potential here. Sailboat access. 120 foot of seawall will accommodate your large boat. 3 bedroom, 2 bath w/pool. Screened lanai, pool bath and pocket sliders. 2 car garage. Circle drive. 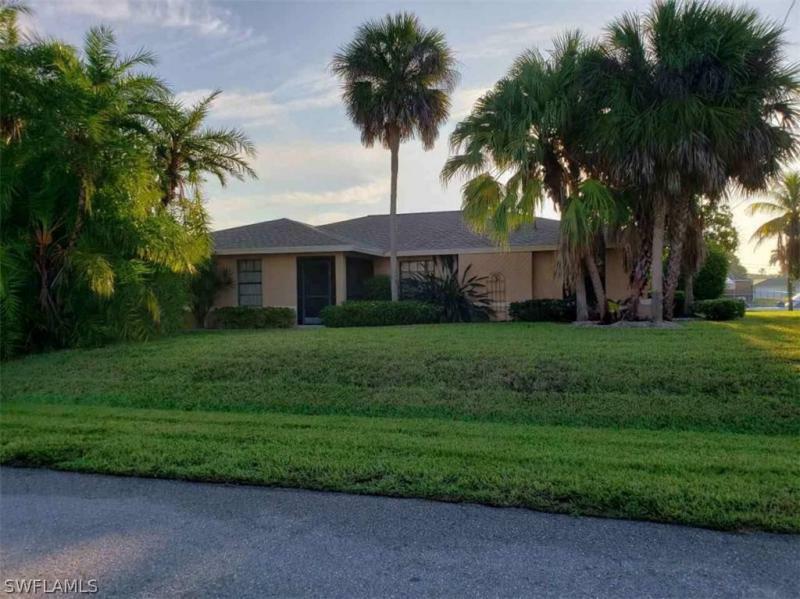 Beautiful, well maintained, gulf access pool home in se cape coral off coronado pkwy. Split floor plan with living/dining and family room, as well as breakfast area. Kitchen with pass-through window to pool deck, dome ceiling with ceiling fan, and breakfast bar. Tile throughout except for two smaller guest bedrooms, vanishing pool sliders, covered lanai and screened in pool deck overlooking gulf access canal with sw rear exposure. Electric heated pool with newer pool pump, landscaping redone recently, concrete boat dock with lift. Short ride to river, only one bridge. Furnishings negotiable. Major price reduction!!! Owner said bring me offers!! Location, location, location! In the palaco grande neighborhood is where you find this gem. 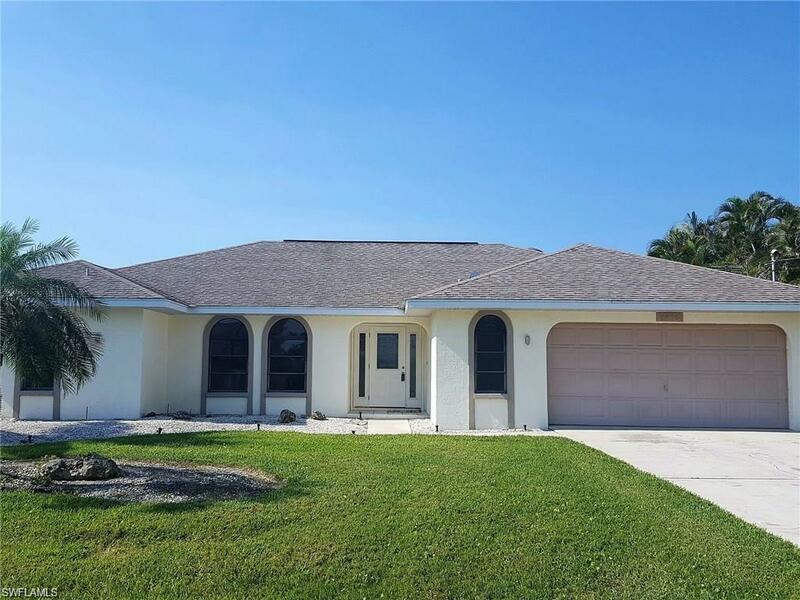 This 3 bedroom 2 bath solar heated pool and oversized covered patio home with all hurricane protected windows and sliding glass doors for safety and peace of mind and a wood-burning fireplace to warm the evenings on a cool night. With an updated kitchen, dock and boat lift on a cul-de-sac with direct access with only one right turn and straight to the river with access to the outer islands and the gulf of mexico and some of the best beaches in the world all located in one of the most prestigous neighborhoods in one of the fastest growing cities in the usa cape coral and close to it all shopping, entertainment and dining. Ready for immediate occupancy and the enjoyment of a new family!!!! Lowest priced, best value big 2 story gulf-access waterfront family home w/ southern exposure! Owner will consider all offers! Seller is also offering a credit towards new carpet and paint! This fantastic & unique 4 bed, 3 bth, pool & private dock/lift. 1st floor master bedroom & guest bedroom. Soaring ceilings, formal sunken dining room & living room. Beautiful wood french doors lead you to the pool area from family room & master bedroom. Center of home features a beautiful fireplace both wood burning & gas. Kitchen offers lots of storage, built-in desk, & wine chiller. Master bedroom offers extra large walk-in closet w/ full organizers, master bath showcases renovated glass shower enclosure w/ triple shower heads, roman cultured marble soaking tub, & dual vanities. Home has 2 zone a/c w/ dual controls. A super elevated pool lanai for all weather entertaining & pre engineered electric vent for that custom summer kitchen you choose. 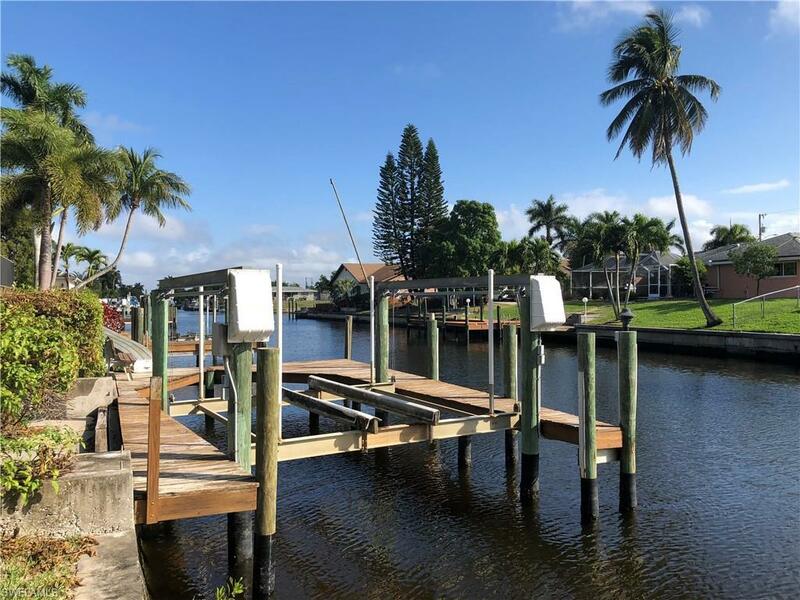 Home has great cement dock w/ boat lift and just a 30+/- minute ride to the river. This is a premier best buy gulf access waterfront value! Home comes w/ 1 yr service maintenance warranty. Also available as a seasonal rental.